The first in the trilogy of comedies in Alan Ayckborn's "Norman Conquests," Table Manners is the story of a philandering loser and the lives he brightens and smudges. The action begins when Sarah and Reg (Annie's older brother) arrive to give Annie the chance to escape for the weekend for a long-needed rest. Fireworks begin almost immediately when Annie tells Sarah she is going away with her sister's husband, Norman. That pretty much sets the tone for the evening: an extended family whose members simultaneously despise each other and can't get enough of each other! Steve Martin, yes the one from Saturday Night Live, takes on an imagined meeting between Picasso and Albert Einstein in a Paris bar named The Lapin Agile. It's the beginning of the 20th century when both men are on the verge of amazing things: Einstein will publish his special theory of relativity in 1905 and Picasso will paint Les Demoiselles d'Avignon in 1907. Supported by a wonderful cast of characters, the two icons have a lengthy and raucous debate about the value of genius and talent; a competition of art versus science. The humor is quick, intellegent, and razor sharp. 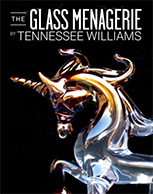 One of the greatest American plays of the 20th century, The Glass Menagerie explores the visceral bonds of family. Southern matriarch Amanda frets constantly over her two live-in adult children—the painfully shy Laura and Laura’s restless poet brother, Tom. With great cajoling, Tom brings home a possible suitor for Laura, but reality soon casts a shadow on Amanda’s dreams for both her children. With an edge as sharp as broken glass, it’s a story that cuts deep into the longing of human hearts. This iconic, emotional and enduring family drama made Williams famous and has become a classic of the American theatre repertoire.